Pearls are gems with its classic beauty that have taken the hearts of women for years. They are one of the most favored gems used to adorn jewelry of all kinds and come in ivory, black, silver, and gray hues. But pearls are extremely delicate and break easily. Here are five helpful tips on how to take care of your pearl jewelry. ● When wearing pearls, put them on last and take them off first before any other accessories. Since pearls are organic gems, they are more fragile. They are made of calcium carbonate which makes them vulnerable to chemicals mostly found in cosmetics, hairsprays, and perfumes. Make sure to put on your lotion, perfume, and makeup before donning your pearls on. 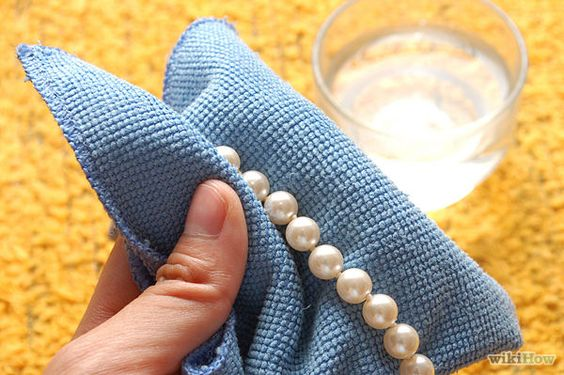 ● You only need a damp cloth when cleaning pearls. 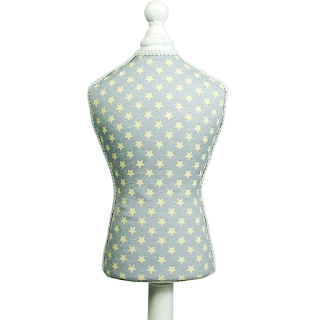 Use a soft and lint-free cloth dampened with water to wipe each gem. Let the pearls dry before storing them away. If the dirt is too stubborn, clean them with a mild soap and water solution, or baby shampoo. Never use liquids with harsh detergent or those that contain ammonia. ● Store your pearl collection separately from other jewelry. This is to prevent them from scratches. 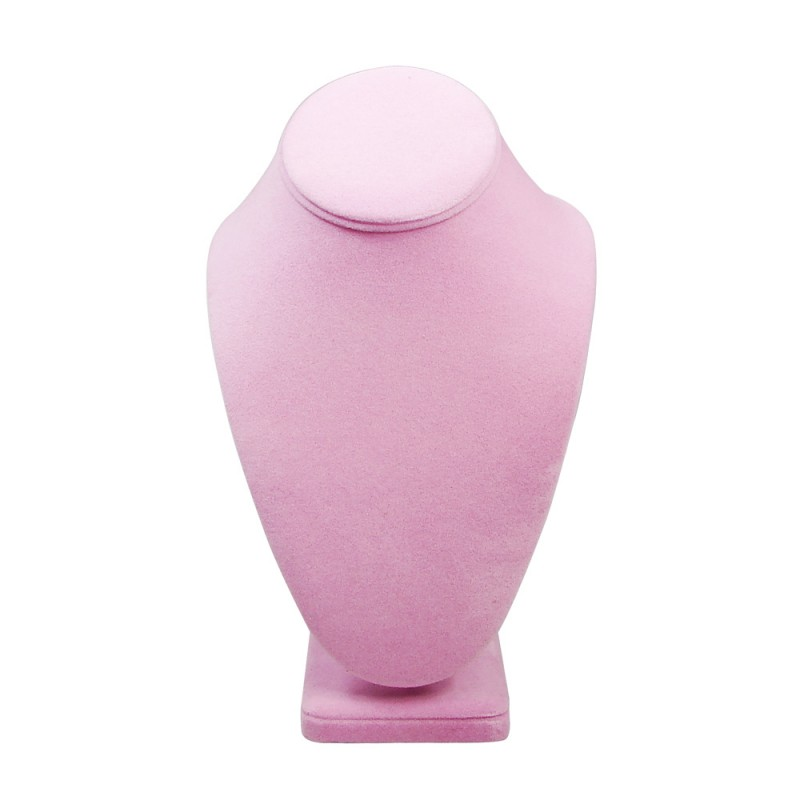 The best jewelry boxes are those with inner velvet lining or necklace displays that have a velvet cover. Velvet is more likely to protect your jewelry from getting any scratch. Silk bag and satin-lined pearl folders can also do the trick. ● Never use an ultrasonic cleaner for your pearls. The cleaner's vibrations can severely damage the nacre coating of your pearls and thoroughly break them. ● Pearls need a glass of water. This can help keep the luster of your pearls when you’re storing them in a vault or a safe. Since vaults and safes have little amount of humidity inside, the pearls may lose their luster. A glass of water will help humidify the air and slow down the dehydration of pearls. Jewelry may be just an accessory for others but for those who have a hobby collecting them, each piece is a treasure they must take care of. That’s why we’re going to give some simple tips on taking care of your jewelry that are easy to remember and do. 1. The best way to clean your jewelry is using a soft cloth which is dipped in warm water with mild soap. 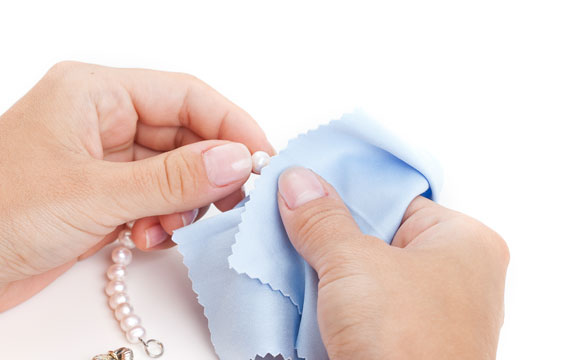 Gently rub the lint-free cloth to your jewelry to clean it. 2. When you’re not using your jewelry then the best way to take care of them is to store them on their jewelry display boxes. This will keep them away from scratches and breakage. 3. Want to clean those diamonds? Well, why don’t you try using vodka to clean it up and clear its color? It will surely work. 4. Never wear your jewelry when swimming on outdoor or indoor pools. There are chemicals in the water that will greatly affect the color of your jewelry. 5. Temperatures can greatly affect the luster of your jewelry. 6. Save your jewelry from all kinds of chemicals. This includes lotions, perfumes and cosmetics that contain several chemicals that can affect the luster of your jewelry. 7. Heirloom jewelry like any other antique needs maintenance and to keep its luster—always take time to go to a jeweler and have your heirloom jewelry check so they can help maintain its look and luster. 8. Never wear your jewelry while taking a bath. Like it was stated earlier, chemicals such as shower gel or bathtub soap can affect its look. 9. Avoid wearing your jewelry in bed and sleeping, such action can break necklaces and bracelets. 10. Avoid cleaning your jewelry near the sink or you might end up losing a piece down the drain. On our last article, we’ve tackled about the different types of display sets that you could use in your jewelry store. And if you have finally decided to purchase one, then here are some of the bestseller display sets from NileCorp.com which includes necklace display sets and jewelry display set alike. This Mini Furniture Jewelry Display features an adorable design of a classic-vintage furniture complete with lounge chairs, which can display up to 8 jewelry including 5 rings, 2 earrings, 1 bracelet and 1 necklace. It comes White Faux Leather with Rosewood Trim or Beige Suede with Vintage Trim, and is perfect for displaying jewelry sets. This Display set features a white faux leather with glossy oak trim that can display up to 29 pieces of jewelry. 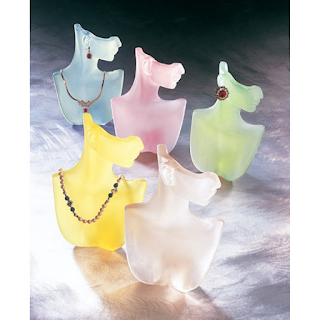 These jewelry consist of 2 pendants, 2 bracelet, 10 ring, 12 base set, 2 earring and 1 necklace. It's pretty much the perfect display that can hold a large set of jewelry collection. This elegant display set features white faux leather that covers padded wood and cardboard display which is also adorned with rosewood-finished, wood-trims. It can display up to 33 pieces of jewelry. This display set includes four-piece base, two tall stages, two short stages, and two combination necklace busts along with one mini necklace bust. Want to display several watches that just came by? This wood trim display set is perfect for jewelry stores who wants to showcase their new collection of watches. It can display up to 20 watches and works well with silver and gold. This 30-set display set comes in a steel grey faux leather w/ black faux leather trim or brown leather trim which gives off a sophisticated look. It can display up to 27 set of jewelry. 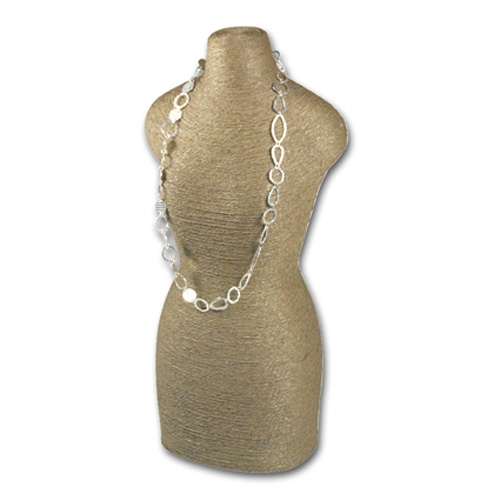 The black faux display is perfect for silver jewelry while the brown-faux leather display works well with gold jewelry.